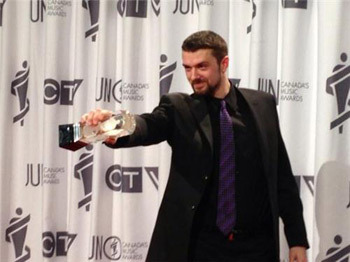 Joel Violette, UNB student and former guitar player with Woods Of Ypres, won a Juno in the Metal/Hard Music Album of the Year category for the album Woods 5: Grey Skies and Electric Light. Just before starting exams, Violette traveled to Regina, SK, to accept the award on behalf of the group. Although Woods of Ypres is no longer together, the 27-year-old UNB student is still making music with his new melodic metal group Thrawsunblat. Besides being a self-taught multi-instrumentalist, Violette is well-educated and athletic. He’s an avid baseball player and studied history in the United States before returning to Fredericton to complete a masters degree in classics. Now in his third year of computer science, Violette says he's amazed at the support he's received. "It's really cool to have so much support from UNB - I've never been congratulated by a prof before while writing an exam."